Please email to info@fasiaplastics.com to start a quote. Our quotation is ready within 5 working days. Please note that we can receive email attachments up to 5MB in total sizes. If you need to send design files larger than 5MB to us, please contact us to set up an FTP link for you to upload these large files. ‧Provide us with 2D/3D drawings or Sample parts. ‧Provide us with your requirements including materials, quantity, packaging and delivery requirements etc. ‧If necessary, we can have a meeting discussion on the production details and provide our professional advice. ‧For sure, we will reply your enquiry with a quote within 1 week. 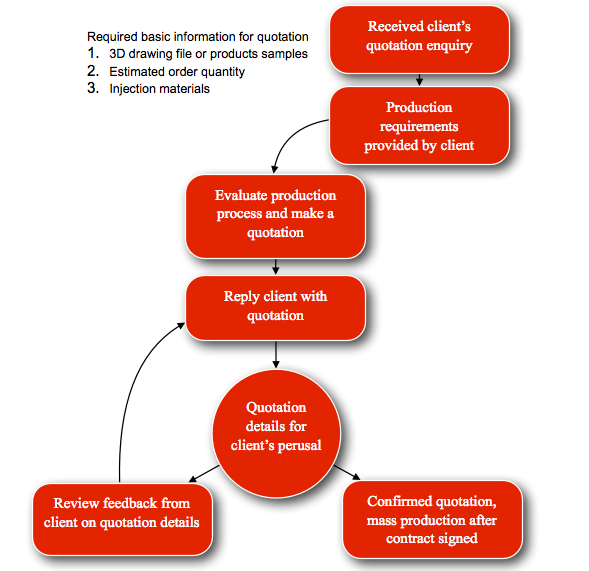 ‧After confirmation on the quotation, we will provide a detailed production schedule to clients. ‧After Mold finishing & Testing, mold trials reports will be provided to clients. ‧The mold will be used for our in-house injection molding or arranged door to door delivery to client. ‧Provide us with the mold details such as mold type, size, no. of mold cavity and clamping force etc. ‧For sure, we will reply your enquiry with quotation within 1 week. ‧Product mass production, checking, finishing, packaging and delivery according to your requirements. ‧Meeting to discuss 2D/3D drawings and the production project details. ‧Provide you with quotation on prototype making, development of the mold and plastic injection molding. Fasia works on lots of brand-new, innovative products so we take IP protection very seriously. All manufacturing procedure will be done in our own factory (in-house production) and CAD files do not have to leave our office.. If you want more protection we will be happy to sign a Non-Disclosure Agreement (NDA) before receiving any confidential information from you. Kindly contact us if you need a sample of NDA for reference.